1 - He has to make the pitcher comfortable. Meaning, the pitcher has to know he will block the 2 strike slider in the dirt, receive the ball well, have great tempo (signs, set up, etc). 2 - A kid has to want to catch. He has to be tough and take a passed ball as an assault on his manhood. If a young man has a great arm but is not tough behind the plate then he goes somewhere else. 3 - Active - Does he work hard behind the plate? Does he establish a good rapport with the umpire? Does he control the action on the field in regards to being vocal and assertive? Give me a kid with those skills and if he has a decent arm he can be a very good catcher. Pop times are treated like the gold standard in a catcher far too often (a lot of those times are a joke as well). Yes I hear about 'pop times' frequently, too. 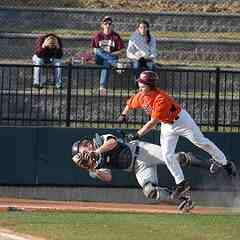 You know it is very important that catchers be able to catch and throw. I think that the stopwatch is kind of way of making us coaches look like we really 'know what we are doing'. In other words instead of the stopwatch being just a small tool in the aid of a catchers assessment we kind of make it the 'big' measuring stick. In reality, catchers do not get to throw fastballs waist high down the middle very often. Those pitches are usually swung at and hit. No, we are mostly throwing the tough slider or sinker down low and have to reach for it. Now getting the ball up to launch and the footwork coordinated is a whole different ball game. My biggest pleasure as a catcher was trying to get the most out of what my pitcher had that day. If me as the catcher could help the pitcher keep the game close than nothing else mattered that much, especially my hitting because that was few and far between. It was a thrill to feel like I was a part of helping my pitchers compete, battle and grind it out to get an opportunity to win a ball game or at least have a good outing. I felt like I was partially responsible for my pitchers success on not. Now I couldn't prevent the guy from hanging a curveball with two men on base but I did take ownership of the pitching staffs performance.